I have a confession. Until this past week, I had never actually eaten my very own sweet cream cheese pretzel in Walt Disney World. So when my husband and I decided to throw caution to the wind and head into the Magic Kingdom at 11pm on a Saturday during Spring Break, we figured it was high time to make a change. After riding everything we possibly could, we headed over to the Lunching Pad and purchased one of these yummy treats. They look like regular soft pretzels, but they have a faint dusting of what seems like crushed pie crust, but is probably some sort of sugary breadcrumb. This nondescript coating sets the stage for the pretzel in a way, because while it has a tinge of sweetness, it isn’t at all overly sugary. The same can be said for the filling of the pretzel. It’s definitely not a cream cheese frosting kind of filling. It’s more of a slightly sweetened cream cheese. Like, take cream cheese frosting and add another 16 ounces of cream cheese into it. It’s tangy, with the consistency of straight cream cheese…just a subtle sweetness added to it. Personally, I’m not a huge fan of cream cheese, but I liked this just fine. It took a few bites to get used to it, but then it became downright addictive! 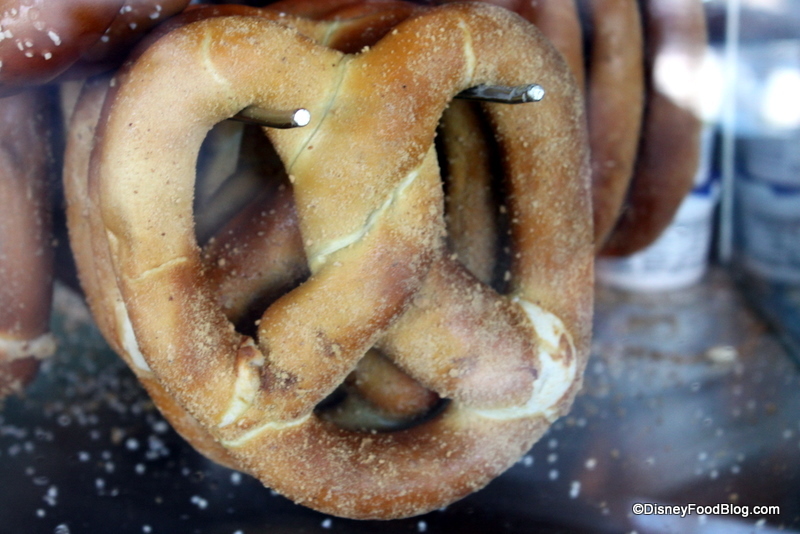 NOTE: These yummy pretzels can be found at the Lunching Pad, but also at Fife and Drum Tavern in Epcot and at Streets of America in Hollywood Studios! They can also be found in Disneyland! 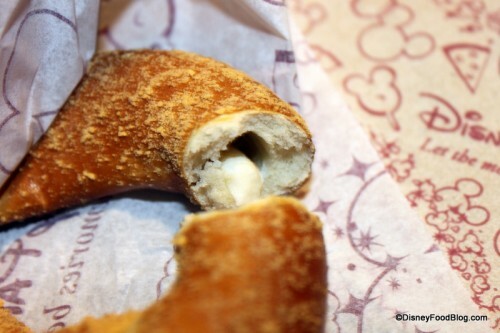 Have you tried the cream cheese pretzels in Disney World? Love ’em or hate ’em? Let us know in the comments section below! I can't wait until may – I get to have another!!! Great pics AJ, is lunching pad the only place to get this yummy treat? Is it a snack on the DDP? What a great breakfast option, is lunching pad open early enough? Thanks your book is awesome just like your blog! I love the cream cheese pretzels! My sister got me hooked on them years ago. There is only one other place to buy these in WDW, but for the life of me I can’t remember where it is. 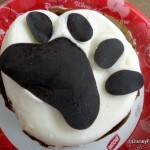 This is probably one of my 3 “must have” snacks when I visit WDW–and I will be there in 1 month! Love the cream cheese filled pretzel. 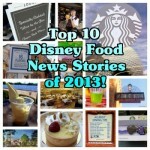 Usually I get one for my breakfast while at Magic Kingdom. This past trip I didn’t get one and now I’m really craving one. I have a weird relationship with the sweet cheese pretzel. The very first bite I had turned me off…yet I kept eating, and I by the end I loved it. So much so that I craved one for months until my next Disney trip. The Lunching Pad was my first stop at the Magic Kingdom, but this time the opposite happened. I loved it at first, but by the end I never wanted to see it again. Ah well! It is an interesting snack item, thanks for the review! My family and I adore them! My husband was anti-cream cheese until he tried one of these bad boys. I’ve read that Schwann’s Frozen Foods (the guys in the yellow trucks) sell very a similar sweet cream cheese pretzel, but I’ve never tried them personally (it might be a bad thing to be able to walk to my freezer for such a tasty treat!). Oy, I am not sure why but I really dislike these pretzels. The last trip my best friend and I took we grabbed one of these and we weren’t fans and after both of our stomachs killed us and we wasted extra magic time sitting in Cosmic Ray’s sipping water and waiting to feel better. I was really sad about not enjoying these because I usually love pretzels, particulary soft ones. Oh well, I still love the savory ones found elsewhere. I’ll say it – I hate ’em! I tried one a few years ago after reading about them as a Must Try in the Touring Plans book. I was really disappointed. I love soft pretzels and could eat a dozen a day, but I’d pass by these without thinking twice now. 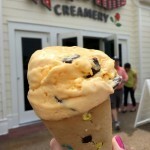 Mmmm I am a big fan of these, and with my many quick trips, it’s always a debate between, Cream Cheese pretzels at Lunching pad, Mickey waffles at Sleepy Hollow, or a Dole whip float at Aloha Isle…. I had one once and didn’t love it. In fact, didn’t like it at all. I LOVE pretzels and cream cheese, but mine was cold and hard. Maybe just a left over? Perhaps I should try one again some time, but I’ve avoided them since that last one. I think I need to put this on my must eat list! This sounds like perfection to me. I adore pretzels and cream cheese! Yummmmmm! YUM! I have never had one of these. I try not to carb-out on pretzels, but this seems well worth it! Thanks for this…we usually are blasting out of that area to get to main street or Adventureland for favorite snack choices. Here’s an idea…this would make a great breakfast snack. 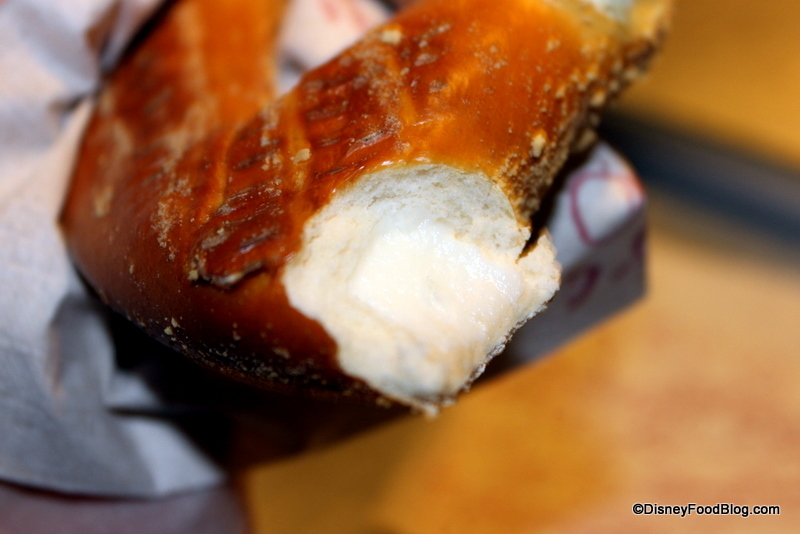 Also, there are the jalepeno cream cheese stuffed pretzels at the cart in Africa of AK next to KS…amazing! I also love the cream cheese pretzels and after checking in at our resort my boyfriend and I headed over the MK as soon as they opened for the day to get one! Also, I must agree with Jeff. The ones from AK are my favorite by far. The Lunching Pad is going to be down for refurb on our trip in early Sept. 2011…is there anywhere else to get these?? Had them back in 2009- Addicted!!! My husband and I are on a quest to find them!! They need to franchise them around the country!!!! 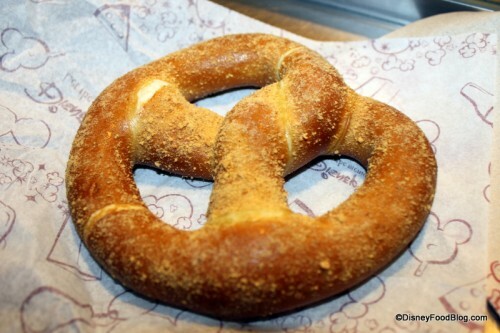 I recently returned from WDW and ordered what I thought was simply a soft pretzel. What a pleasant surprise when I learned it was filled with sweet cream cheese! They are addictive and the only plus from overdosing on these babies is that you do so much walking around in the various parks that you’re sure to burn them off. DELISH! 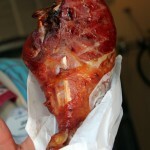 Me and my fiancé just got back from Epcot in Orlando and had one of these preztels from a snack cart by the American building in the world showcase, they also sold turkey legs. They are very addicting. You can get them at Epcot, the cream cheese one and the jalapeño cheese, at the american pavilion on a cart there. I didn’t even know they had those at the mk!!! They’re delicious!!! Kris and Fabi — Yep! You can get them at Fife and Drum!! YUM! My family enjoyed our first trip to WDW Jan 2012. My husband took one of our kids to the rr during Wishes at MK and came back w one of these delish treats. I loved it. so much so I made the kids share a snack one day so I would have an extra DDP credit to get one more pretzel. What kind of mother does that… seriously though, that is one good pretzel. 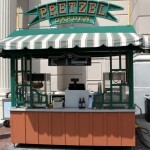 I asked around and found them at F&D in Epcot like the other commenter’s said but I also stumbled upon a pretzel cart in HS that had them, (on Streets of America near honey shrunk kids playground) an unexpected surprise since I had been told they were only in MK and E.
Jenn — Great reminder! We just posted last week about these pretzels in Hollywood Studios! I’ll add the info to the post. I have been a fan of these pretzels forever, I live in Washington and have always searched for a place I can purchase online. Is there such a thing? Please say yes.